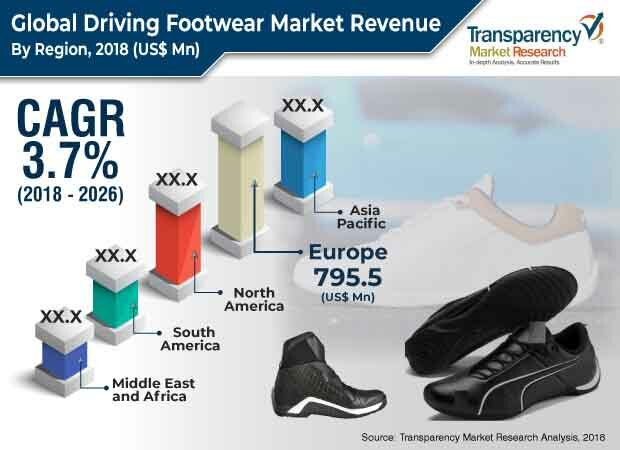 According to a new market report published by Transparency Market Research titled ‘Driving Footwear Market – Global Industry Analysis, Size, Share, Growth, Trends, and Forecast, 2018 – 2026, the global driving footwear market is expected to reach US$ 3,087.9 Mn by 2026, expanding at a CAGR of 3.7% from 2018 to 2026. In terms of volume, the market is expected to reach 19,259.9 ‘000 units by 2026, expanding at a CAGR of 3.5% from 2018 to 2026. Based on region, Europe held the highest market share in the global driving footwear market in 2017.The market is segmented by regions into North America, Europe, Asia Pacific, Middle East & Africa (MEA), and South America. The driving footwear market in North America holds the second largest share in the global driving footwear market and is expected to grow moderately over the forecast period. Driving boots hold the highest market share in North America among different types of driving footwear. Driving sneakers are seeing increasing demand and their growth is expected during the forecast period. The online driving footwear market is expected to grow faster than the offline driving footwear market. In 2018, the population in North America reached 494.4 million, of which about 40.0% is aged between 25-54 years. These are the major purchasers of online driving footwear. In 2018, internet penetration in North America reached 90.0% of the population. The U.S. holds the lion’s share in the North America driving footwear market, with a share of more than 80.0% expected by the end of the forecast period. As per Footwear Distributors and Retailers of America (FDRA), footwear is one of the most purchased items in the U.S. Per capita footwear consumption in the U.S. is seven pairs of shoes. The U.S. is one of the largest importers of footwear in the world. Almost all the footwear used in the U.S. is imported. As per current data from FDRA, 2.39 billion footwear pairs sold in the U.S. are imported and only 25 million footwear pairs are U.S. made. The driving footwear market in Europe is the largest in the world and is expected to grow moderately over the forecast period. Driving boots hold the highest market share in Europe among different types of driving footwear and is expected to hold a market share close to 60.0% by the end of the forecast period. Driving sneakers which are widely popular in Europe are expected to see increased demand during the forecast period. The U.K., Germany, Italy, France, and Spain are major markets in the Europe driving footwear market, with a share close to 75.0% expected by the end of the forecast period. Europe is the largest footwear importer in the world. The Asia Pacific driving footwear market is the third largest market in the world and is expected to grow the second fastest over the forecast period. Driving boots are expected to hold the highest market share of 54.0% by the end of the forecast period. Driving sneakers are expected to witness increased demand during the forecast period. China, Japan, and India are major markets in the Asia Pacific driving footwear market, with a share close to 70.0% projected by the end of the forecast period. Asia Pacific is the largest consumer and manufacturer of footwear. With rising demand for footwear across Asia Pacific, driving footwear is expected to see enhanced demand. The South America driving footwear market is the fourth largest market in the world and is expected to grow the fastest over the forecast period. Brazil continues to hold more than 60.0% share of the driving footwear market in the region and the share is expected to reach close to 65.0% by the end of the forecast period. The MEA driving footwear market is the smallest market in the world. Driving footwear is expected to hold a market share close to 53.0% by the end of the forecast period. GCC and South Africa are major markets in the MEA region. The study provides a conclusive view of the global driving footwear market by segmenting it in terms of product type, material type, vehicle type, consumer group, and distribution channel. In terms of product type, the driving footwear market has been classified into boots, shoes, and others. The others driving footwear category include sneakers, training shoes, etc. Based on material type, the market has been segmented into leather, synthetic, and natural fibers. In terms of vehicle type, the market is segmented into two wheelers and four wheelers. Based on consumer group, the market is classified into men and women. Based on distribution channel, the market has been segmented into online and offline.